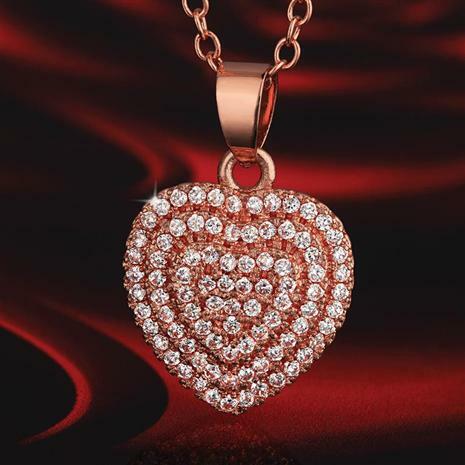 This is a beautiful crystal encrusted gold heart pendant, especially for the price. Magnificent! Why does the heart symbolize love? It could be because the Ancient Egyptians believed the heart contained the very essence of your soul. Or it could be because the Ancient Greeks believed the heart was a compass pointing toward your desires. The more physiological answer— when you see the one you love, your heart beats faster— also makes sense. The answer, much like your heart, is complex and unknowable. And that’s what makes it special when you give your heart to another. If you’ve already given her your heart metaphorically, the Valentine’s Heart Pendant allows you to give it literally. This rose gold-finished heart pendant, encrusted with three layers of European crystals in concentric heartbeat shapes, was designed to quicken the pulse. If she makes your heart miss a beat, this is a deal you shouldn’t miss out on.